THE OSMONDS, GARETH GATES, LOUISA LYTTON, ANDY ABRAHAM, CHICO and SHANE RICHIE JUNIOR will take to The Edinburgh Playhouse stage on Monday 18th March 2013 as BOOGIE NIGHTS – THE 70’S MUSICAL IN CONCERT heads out on the road and plays over 50 dates across the UK with the biggest 8 star cast line-up of the year. Boogie Nights was the West End’s original jukebox musical, conceived by Jon Conway and Shane Richie in 1997, and followed the hilarious and heart-warming story of Roddy O’Neil. Set in a provincial British town in the height of the disco seventies it completed 5 UK tours after its London success and has also toured the world. Boogie Nights returns in 2013 as a remixed concert version of the ultimate party show! Join the original characters for a fantastic evening’s entertainment featuring live music, multimedia and no less than 70 of your favourite hit songs from the 70’s. 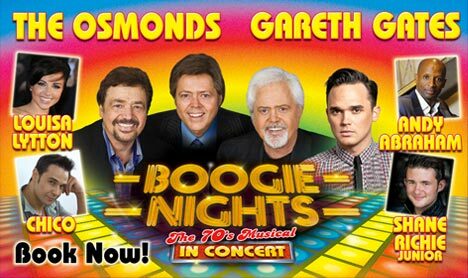 THE OSMONDS will return from the USA as special guest stars, performing not just their own hits such as Crazy Horses and Love Me For A Reason, but also a range of classic hits. 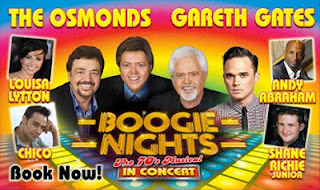 Jimmy Osmond first appeared in the award-winning Boogie Nights in 2004 and now for the first time ever he and his brothers will appear in a musical together. GARETH GATES will play heartthrob Dean, delighting his many fans who have seen him in West End classics such as Les Misérables and Legally Blonde, with a vocal range of pop classics covering If You Leave Me Now, Disco Inferno and a feature with The Osmonds including a cover of Donny’s Puppy Love. Debs will be played by LOUISA LYTTON who played the Ruby in EastEnders. After a stint on The Bill as PC Beth Green, Louisa was a contestant on Strictly Come Dancing. Boogie Nights – the 70’s Musical in Concert will mark Louisa’s musical debut and she can’t wait to belt out I Will Survive and Don’t Go Breaking My Heart. Joining the stellar cast are The X Factor finalists ANDY ABRAHAM, who will play tough guy soul singer Spencer and perform Barry White classics such as You’re My First, My Last, My Everything and CHICO who was also a finalist on Dancing On Ice 2012 and will play Terry bringing his energetic dance moves to such hits as Le Freak. The all star line up is completed by a theatrical first when SHANE RICHIE JUNIOR takes over the role of Roddy, as created by his father, the original seventies bad boy. It is the first time a role created by an actor has been inherited by his son and 22 year old Shane Junior will prove to be a real chip off the old block as he powers through hits such as Blame It on the Boogie. With a cast of 15 musicians, singers and dancers Boogie Nights – the 70’s Musical in Concert features all your favourites from the original show including Y.M.C.A. and Happy Days, We Are Family and Boogie Wonderland and promises a party atmosphere you won’t want to miss!